Accra, February 2018: Ghana, known for being one of Africa’s major e-waste hot spots, has taken another important step towards more sustainable management and recycling of electronic waste. On 15th February 2018, the Ministry of Environment, Science, Technology (MESTI) and the Environmental Protection Agency (EPA) officially launched the Technical Guidelines on Environmentally Sound E-Waste Management at the College of Physicians and Surgeons, Accra. The development of the guidelines was supported by the Swiss-funded SRI-project under the lead of the Ghana Cleaner Production Centre, the Oeko Institute, the World Resources Forum and Empa. It included a two-year process of stakeholder participation by policy-makers, industry as well as informal sector representatives, civil society organizations and scientists. In August 2016, the President of Ghana had signed the Hazardous and Electronic Waste Control and Management Act (Act 917) followed by the Hazardous, Electronic and other Wastes (Classification), Control and Management Regulations (LI 2250). Together, the two legal frameworks set the background for a new and innovative strategy towards a sustainable management of e-waste in Ghana. Based on this, MESTI and EPA developed, with the support of the Swiss-funded SRI-project, Technical Guidelines on Environmentally Sound E-Waste Management in Ghana. The guidelines were officially presented to the public on 15th February 2018 at the College of Physicians and Surgeons in Accra. They cover specific requirements for various economic actors that are active in the e-waste recycling chain such as collectors, collection/buy back centres, transporters, treatment facilities and final disposal sites. Based on ambitious international standards and certification frameworks, the new Technical Guidelines were specifically tailored for the needs of the Ghanaian context drawing on good operational practices on the ground. The broad stakeholder group committed in the development of the Technical Guidelines attend the Official Launch Event on 15 February 2018 in Accra. “Ghana is the first country in Africa to launch official guidelines for sustainable e-waste recycling management”, said Mr. Mathias Schluep Program Director of the World Resources Forum and lead coordinator of the international SRI programme. This represents an important cornerstone in tackling the e-waste problem in the country and a shining example for the entire region. Up to now, e-waste has mostly been recycled without any measures to protect human health and the environment in Ghana. In order to change that, the new guidelines support all actors, from the small scale collectors to the collection/buy-back centers, transporters and treatment facilities, to implement necessary basic steps for the environment and the people’s health. Furthermore, MESTI and EPA envisage including the Guidelines on Environmentally Sound E-Waste Management in Ghana as a schedule to the mandatory regulation LI 2250. As reported by the Ghanaian Times on 20 February Mr. John Pwamang, Deputy Executive Director of the Environmental Protection Agency (EPA), noted that “the guidelines would help in the enforcement of the regulations regarding recycling of e-waste and lessen pollution emitted from those using old methods of recycling”. On the same occasion, Mr. Mathias Feldmann, Deputy Head of Mission, Embassy of Switzerland highlighted that “the Embassy was focussed on building partnerships on both, the private and the public sectors to promote sustainable development” (Ghanaian Times, 20 February 2018). However, the launch of the Technical Guidelines is only a first step. From now, they will be an effective instrument to support e-waste recyclers to improve depollution activities and implement health and safety measures on-site. Furthermore, they serve as an environmental benchmark for small scale collectors, buy back centers and transporters that are engaged in the e-waste business. “We aim at developing the whole reverse value chain of the e-waste sector step-by-step, from where it stands today towards environmentally sound recycling practices. Of course, this cannot happen overnight, however, gradual monitoring and auditing activities supporting, but also demanding necessary steps according to the newly developed guidelines will ensure constant change in the sector. By this, we aim at step-wise improvement in the environmental as well as the health situation of the people in Ghana engaged in e-waste recycling” says Mr. Lambert Faabeluon, Director for Standards Compliance & Enforcement at EPA. In May 2017, the second draft of the guidelines was tested in five private sector recycling facilities by possible future public and private sector auditors. Especially, the active participation of the Ministry of Environment, Science, Technology and Innovation (MESTI), Manufacturing Industries Division as well as the Standards Compliance and Enforcement Division, both EPA Ghana, are to be highlighted here. In the same context, special thanks of the project team go to Blancomet Recycling Ltd., City Waste Recycling Ltd., Fidev Recycling Ltd., Presank Enterprise Ltd and Agbogbloshie Recycling Centre that all actively participated in the field tests of the recycling guidelines at hand. 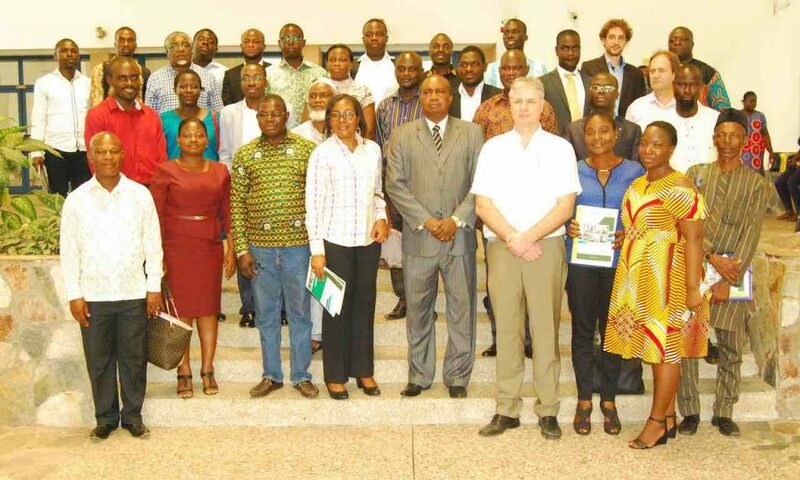 In January 2018, the final draft of the guidelines was carefully reviewed by stakeholders such as EPA, Ghana Standards Authority, Ministry of Environment Science, Technology and Innovation, Department of Factory Inspections, GIZ, Ghana Atomic Energy Commission and other independent private institutions within a stakeholder workshop at Aburi from 24th to 26th January 2018. Final changes and reviews were included resulting in the present final version. The Technical Guidelines on Environmentally Sound E-Waste Management in Ghana can be downloaded here.